A new joint venture between SmartCentres REIT (SRU-UN-T) and SmartStop Asset Management, LLC to build self-storage facilities might be best described by the first word in the companies’ names. SmartCentres president and chief executive officer Peter Forde said the real estate investment trust has “a lot of great real estate” to build on. As such, it’s looking beyond its traditional retail tenants to consider the potential of condominiums, apartments, townhouses, offices, seniors homes and medical buildings to fill empty lots. Self-storage facilities also fit that niche. SmartCentres properties are largely anchored by Walmart stores and have had occupancy rates of greater than 98 per cent for several years. SmartCentres had no Sears stores and only two Target stores, and other retail owners may be courting tenants for their vacated big box Target and Sears Canada stores. These tenants may otherwise have taken new space in a SmartCentres shopping centre. These new intensified uses, such as self-storage and the others listed above, offer an opportunity to better use available land and drive traffic to the centres. “We build very little on spec,” said Forde. “We build when we have a signed lease. First-generation self-storage facilities were generally single-storey buildings in industrial areas. They were followed by facilities located closer to the people who use them, but again were usually one floor. More recent projects are up to five storeys and are more visually appealing, which makes them a good match for shopping centres. The first facility announced under the SmartCentres-SmartStop joint venture will have 990 units in an approximately 100,000-square-foot building on a 2.23-acre site. It’s located behind The Home Depot in the SmartCentres Leaside shopping centre at 145 Wicksteed Ave. in the Toronto borough of East York. The project is expected to break ground this year and construction is slated for completion in late 2019. The Crosstown light rail transit system being built along nearby Eglinton Avenue is going to bring more condo and apartment construction to the area, which will mean more residents who might need extra storage space. There’s less self-storage in Canada than in the United States per capita, and the market has room to grow despite an increasingly competitive market as more people move into smaller apartments and condos due to the high price of single-family houses in many cities. SmartStop operates 11 facilities in the Greater Toronto Area and Greater Golden Horseshoe and was looking to develop more, which is why it approached SmartCentres. Management didn’t want to sell land to the Los Angeles-based company, but suggested a joint venture instead, with the sites being co-owned 50-50 by each partner. “We find the locations, or we have them already, and we get them municipally approved in terms of zoning and site plan approvals,” said Forde. “We build them and they take over from there since they’re the experts in operating a self-storage facility. SmartCentres has applied for site plan approvals for three more Ontario self-storage facilities in Oshawa, Brampton and Vaughan. It’s expected approvals will be granted, construction will begin and they’ll be open by the end of 2019. Forde said there are another eight to 10 SmartCentres-owned sites in southern Ontario in which SmartStop is interested. The parties are also talking about moving into other provinces together, but no deals have been struck. It’s not an exclusive joint venture between SmartCentres and SmartStop, though Forde said there are requirements that they talk to each other before developing new self-storage facilities. Forde said the relationship between the two companies has been even better than expected to this point, and he looks forward to a long-term partnership with SmartStop and other entities it may join with to intensify its properties. SmartCentres is also a joint venture partner in the Premium Outlets locations in Toronto and Montreal with Simon Property Group. Vaughan-based SmartCentres is one of Canada’s largest REITs, with total assets of approximately $9.4 billion. It owns and manages 34 million square feet of retail space. 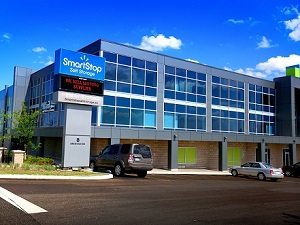 SmartStop is a diversified real estate company focused on self-storage, student housing and senior housing assets. It has approximately $1.5 billion of real estate assets under management in the U.S. and Canada, including 116 self-storage facilities comprised of approximately 73,560 units and 8.5 million rentable square feet. SmartStop’s real estate portfolio also includes five student housing communities with approximately 2,800 beds and 1.1 million square feet of space, as well as three senior housing communities with approximately 350 beds and 250,000 rentable square feet of space. SmartStop is the sponsor of four public non-traded REITs, including Strategic Storage Trust II, Inc., which is responsible for the deal in the initial Leaside joint venture location.